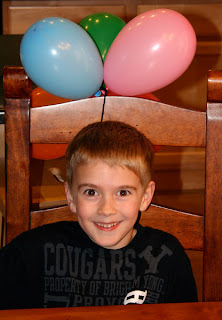 On the fourth of March, Robby turned seven years old. I still haven't quite come to terms with the fact that I am the mother to a seven year old. He is growing up way to fast, but I am so proud of him, and so lucky to be his mom. I truly feel so blessed to be the mom to such a great kid. I couldn't ask for a better son. I love you bud! I have lots of pictures from Robby's birthday so they will be posted soon.